We're always happy to answer any questions you may have. Contact us directly at (860) 659-3587 or jill@crvchamber.org. Who exactly is the CT River Valley Chamber of Commerce? The Glastonbury and East Hartford Chambers merged in 2016 to become the CT River Valley Chamber of Commerce. We have a full time staff serving these towns as well as the surrounding area. Who is a Chamber Membership for? A Chamber Membership is for everyone from individual professionals to national corporations. It’s for those who think upwardly, and wish to grow their business or get more involved in their community. What is the primary goal of the Chamber? It is our mission to give you the opportunities you need to grow and get real results. For us, it’s about cultivating a healthy business community and bettering our region of the state through that axiom. Some Chambers focus on tourism. We are an event-driven Chamber, meaning we put an emphasis on providing a place and proper atmosphere for networking between professionals. We believe that success in the business world comes from strong connections to like-minded peers. What is your relationship with local government? The CT River Valley Chamber contracts a lobbyist to monitor legislation on our behalf, we provide information to our members but do not take positions frequently due to the diversity of our Membership. We offer tiered dues depending on the size of your business. Membership is renewed annually on the anniversary of your join date. Upon joining the Chamber, we’ll schedule a ribbon cutting which we invite the press as well as our Board of Directors and Ambassadors to. This is a great photo-up and can be a ‘mini open house’ for your business, if you so choose. Afterwards, news of your ribbon cutting goes out across all of our social media platforms and in a press release to multiple publications. We have a full roster of special interest groups and events throughout the year to experience. You may also schedule a Business After Hours. There is one Business After Hours per month. What kind of special interest groups do you have? Special interest groups include Women of the Workforce, Advanced Creativity in Marketing, an Industry Specific Leads Group, HR Roundtable and Health & Wellness Council. Don’t see what you’re looking for? You can propose a new idea for a special interest group or committee, and we can help you recruit. Can my business be marketed by the Chamber? Yes! We’re here to promote YOU. Any company news can go in our Monday newsletter, where we promote events and new developments with members. We can also send out a ‘Chambertisement’ standalone e-blast to our subscribers for a small cost. We're also very supportive of our members on social media. Need more likes or shares? Just ask! Additionally, our Chamber offers web banner ads and sponsorships which display your logo on both printed and electronic promotional pieces. How can I get a feel for the Chamber without a paid membership? Attend some of our events that are open to the public. You’ll see what a great time we have and the networking opportunities we provide. We have Leads Exchange groups which are open to everyone and are a perfect way to get a glimpse of what we do while engaging with other Members. Join our mailing list so you can see what the Chamber, and its 600+ members do. What sponsorship opportunities are available at the Chamber? Check out our many events – we have lots of sponsorship opportunities for you. We can customize annual sponsorships to meet your marketing needs and budget. My Business is an institution and we have no need for growth. 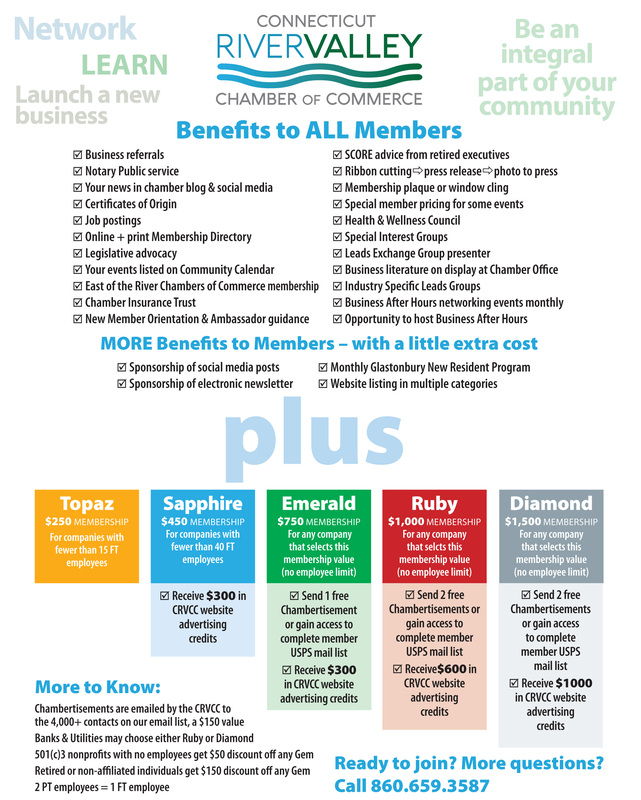 What is the value of a Chamber Membership? Branding an institution, maintaining or improving its reputation with a diverse group of business professionals can only enhance your work. More customers & clients, higher registrations or good will ambassadors are found in the Chamber Membership. We also make the hiring process easy. You are likely to discover the next great member of your team through the Chamber. What sets the CT River Valley Chamber apart from other Chambers? This Chamber operates from two of the most burgeoning towns outside the capitol city – Glastonbury & East Hartford. This means a wider network with greater variety and bigger, more frequent events and meetings. Both communities are ideal locations for doing business, starting a family, or pursuing higher education. Glastonbury has one of the best public school systems in the state, and East Hartford is home to both Goodwin College and Stone Academy. We take great pride in investing in future business leaders, as we usher in a new generation of job seekers. We also put an emphasis on fun. It’s simple. Networking doesn't have to be stuffy, or a burden. We know your time is valuable. For a Chamber Membership to be worthwhile, you must not only be able to use it to further your professional career, but the process itself should be both enjoyable and seamless. We take the lead showing businesses that they can get bigger things started with a simple handshake.